basically mix all together to make a dough. This made quite a lot so we just used half. Wrap any that you are not using in cling film to stop it drying out. 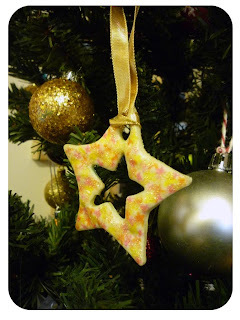 I picked up some tips this year from reading different blogs but now I can't remember where I read what, so a general thank you to everyone who has made these ornaments and blogged about it. 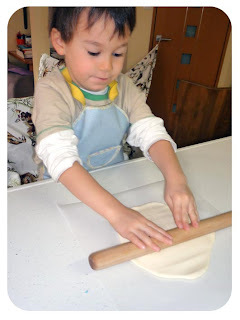 This year we tried rolling the dough on grease proof paper, I had to hold it as he rolled because it slipped about otherwise. This meant though that we could roll the dough quite thin. We cut them out and removed the excess from around the shape. We also cut designs into the main shape using my bento cutters. I then slid the grease proof paper onto a plate and microwaved the shapes, it took about 5 minutes on 600W for about 8 shapes, I did leave one lot in too long and burnt a couple, so keep an eye on them. I also turned them over half way through. As I took the first lot out to cool, Ebi-kun set to work on the second batch. 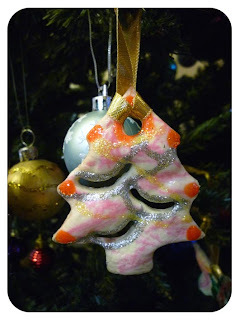 We coloured them using felt tip pens, which I found worked better than paints, last year some of the ornaments went soggy when we painted them. Then I varnished them all with a clear varnish, we left them to dry over night. The next day he went to town with the glitter glue and once they were dry we threaded ribbon through and hung them on the tree. Thanks For the baking paper tip, I will do that next time, ebi-kun is not too fussy on what he rolls flat - my poor fingers! did this with the girls on Sunday. The ornaments are still not dry. I've put them in the oven, on the radiator, but they remain soft on the backsides. 3 things may be to blame: bread flour (all we had) and 1/2 cup of sea salt (ran out of table) and I also read that European flour has more fat in it than American flour. We're going to paint/decorate them today anyway. We'll just try it again next year. Merry Christmas to you, btw!! Can we not bake these in the oven at 200 degrees for about 5-10 mins keeping a watch on them instead of a microwave. I no longer have a microwave. Any hints? Yes, you can bake them, just make sure they are baked all the way through so that they are dry otherwise they will go moldy. I no longer have a microwave. 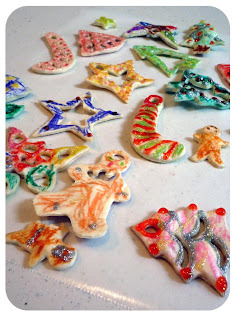 Question: Can I put my shapes onto wax paper and put in the oven for 5-10 mins at 200 degrees watching them ? Help Please?